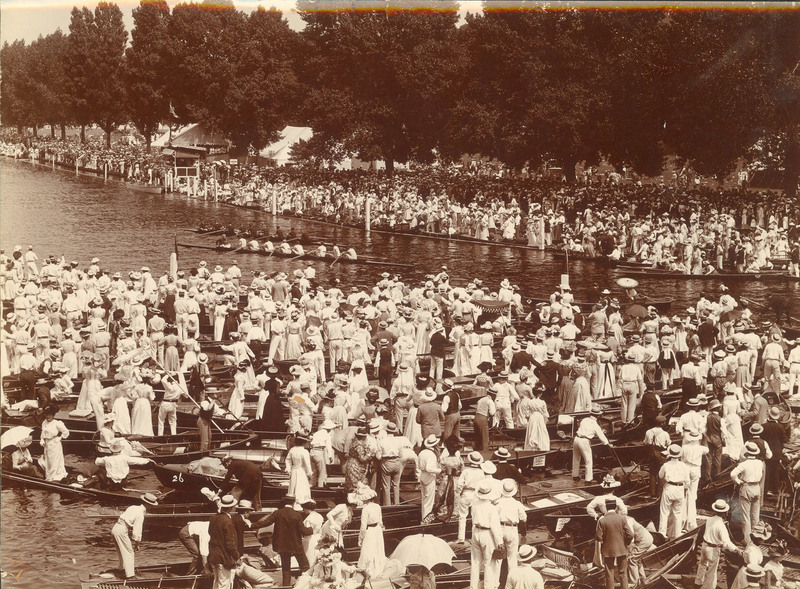 In 1901, Penn was represented by Coach Ellis Ward and his eight oared crew at the Henley Regatta in England. This event was a highlight of Ward’s long tenure as coach from the beginnings of intercollegiate crew at Penn in 1877 until Ward’s departure from Penn in 1912. 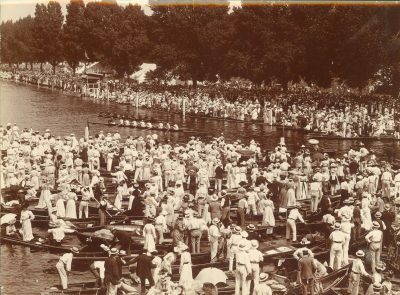 Penn’s presence at Henley reflected the prominent position of Penn in the world of rowing at that time. Newspapers gave full coverage to the crew, beginning with documenting the enthusiastic crowds that gave the Penn men a grand send off. 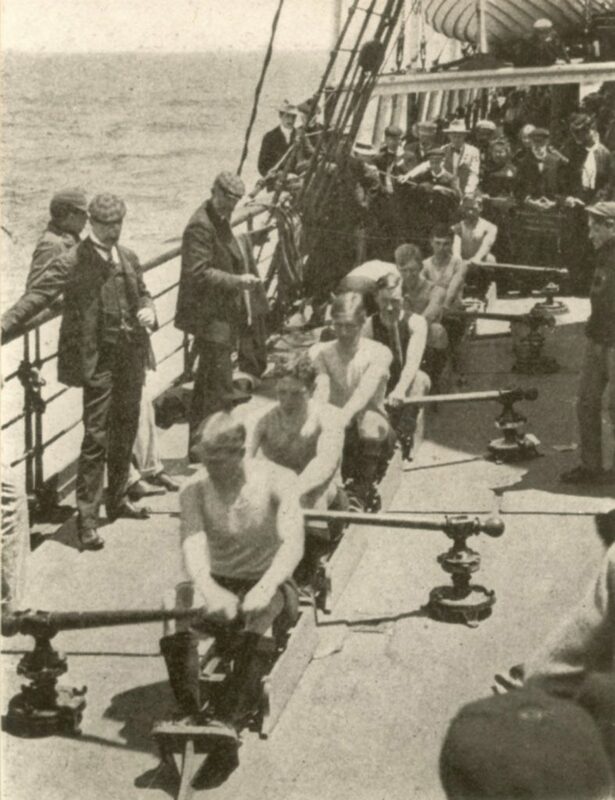 On the voyage to England, photographers snapped shots of the crew training on rowing machines attached to the deck of the boat. Photographs were taken at every stop on the crew’s tour of England, culminating with the Henley regatta itself. At the regatta, the Penn Crew had to row a far shorter distance than they were used to, and therefore had to change its strategy. 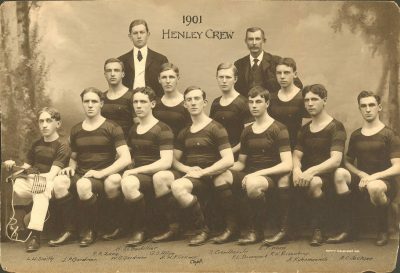 The Penn crew was composed of R. R. Zane, R. H. Eisenbrey, F. L. Davenport, S. Crowther, Jr., A. H. Flickwir, G. S. Allen, W. G. Gardiner, J. P. Gardiner, and L. J. Smith as coxswain with A C. Jackson and A. J. Kuhnmuench as substitutes. The Penn Crew won both of its trial heats at the regatta, but lost in the final to the English Leander crew. This journey was a success. 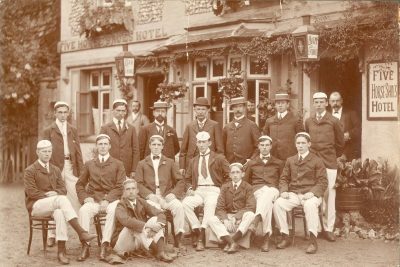 Penn left Henley with the distinction of being the only American eight man crew to mount a serious challenge to Britain’s retention of the Grand Challenge Cup, the most prized trophy in amateur rowing.